Nothing new there, of course: The men’s tennis tour always starts its New Year before the calendar tells it to. With two days left until 1 January, three tournaments got under way, and that was aside from the lucrative Abu Dhabi six-man tour-de-force—won by Novak Djokovic—and the ITF mixed team event, the Hopman Cup, in Perth. It’s tempting to say again, “nothing new there”… except that even by Roger Federer’s standards, this has been a start to a season to keep even his most avid fans on their toes—and any number of other news-worthy headlines as secondary features: Andy Murray returning to the fray after more than three months following back surgery; Djokovic appointing Boris Becker as his coach; David Ferrer sacking his coach of 15 years’ standing. But, effortlessly it seemed, Federer managed again to stride into the spotlight. His off-season had already been rejigged to drop a repeat of his South American tour in December. Instead, a short break in the Maldives was followed by a long training block at his Dubai base to make up for the time lost with injury during 2013. Mid-December brought news that he, with long-standing friend and agent Tony Godsick, had set up their long-anticipated athlete management firm. Coming within days of Djokovic’s tie-up with Becker, this had the feel of a wind-up—and Federer had, after all, invited a stream of colleagues to join him in Dubai for training sessions. Edberg was promptly followed by Robin Haase, Blaz Kavcic and Alexandr Dolgopolov. And though the conjecture continued apace—helped not a little by Edberg commenting that, had it not been Federer doing the asking, he would not have considered any coaching role—fresh news pushed this to one side. From Dubai, a week before Christmas, came a short video of the man himself in training—with a tantalizing glimpse of the new racket he trialled, and then abandoned, ahead of the US Open Series. Two days before Christmas, the Federer brand launched a new logo to mark the 10th anniversary of the Roger Federer Foundation. On Christmas Eve, in a stroke of timing genius, came the announcement that he and wife Mirka were expecting another child, concluding simply: “Happy Holidays”. Subsequently quizzed when he arrived for another departure from the old routine—to play in Brisbane—he refused to share any further detail, and his 2014 schedule, which also made a belated appearance, gave nothing away. Still Federer was not done. Two days after Christmas, his Facebook page confirmed that Edberg would join his team at the Australian Open. That the partnership was for a trial period until the end of the hard-court season in Florida mattered little: It took no time at all to garner more than 50,000 ‘likes’. But not content with dropping bombshells through his own media, Federer was handing out Christmas gifts to the Swiss media during this holiday season, too. One of the first, with Credit Suisse, confirmed he was indeed working with a larger-headed racket again. Another, for the Swiss-French newspaper Le Matin, revealed that he and his family would forgo Christmas in Switzerland to continue his hot-weather training in Dubai. Yes, I’m going to play in Australia with a similar model [to the one in Hamburg]. Actually, I wanted to test it right after the US Open again, but I had so much going on with me and my game that I held off. Now I’ve had more time to make further small changes with Wilson on the details. You must always think twice before changing your racket, because it is extremely important. But now I feel it is the right time for a change. I’ve played through two and a half weeks with the new model and am confident. It feels good in my hand. But the test will be on court. We’ll see in in Australia. With a new racket and one of the game’s most stylish serve-and-volley players as his coach, perhaps he is proposing to play a more offensive game in 2014? No, no… Each player has his own ideas and his own style that he has to work with. I have both a forward game and a baseline game. I think that makes me an interesting player to coach! In fairness, he has always favoured an offensive game, showing a new keenness to come to the net since his 2011-2012 surge—but more of the ‘Edberg factor’ later. So to his 2014 schedule, released more than a month later than usual, just as he arrived for his first tournament of the season in his debut in Brisbane. It marked, in fact, the first time he has played a warm-up in Australia since he won the Sydney title in 2002. On that occasion, he arrived having just one title to his name, the previous year in Milan. This time, he also arrived with just one title from the previous year, in Halle. His commitment to the pre-Melbourne warm-up, unlike the rest of his schedule, was known some time before, an early signal that fresh ideas and new starts were on Federer’s mind even before Edberg and a 98in racket. He even signed up to Brisbane’s doubles with Nicolas Mahut—another serve-and-volley enthusiast. I don’t always want to make an excuse for a defeat out of respect for the opponent. I would rather try to fight my way out of the hole… In Gstaad it would have been better not to start. In future, I will have to pay attention to my body, even if it means cancelling tournaments—it is certainly better to be honest with yourself. I sensed [around the French Open] that something was wrong in my game, I was lacking practice, I was lacking matches, I was lacking just the fitness, I guess, because of all the setbacks I had. Within my team, we knew realistically we couldn’t aim for winning Grand Slams straight away, so that’s why it was a more difficult and challenging season in many ways. [But] I finished sixth in the world after all the problems I had, and hopefully this year I can have a better season. 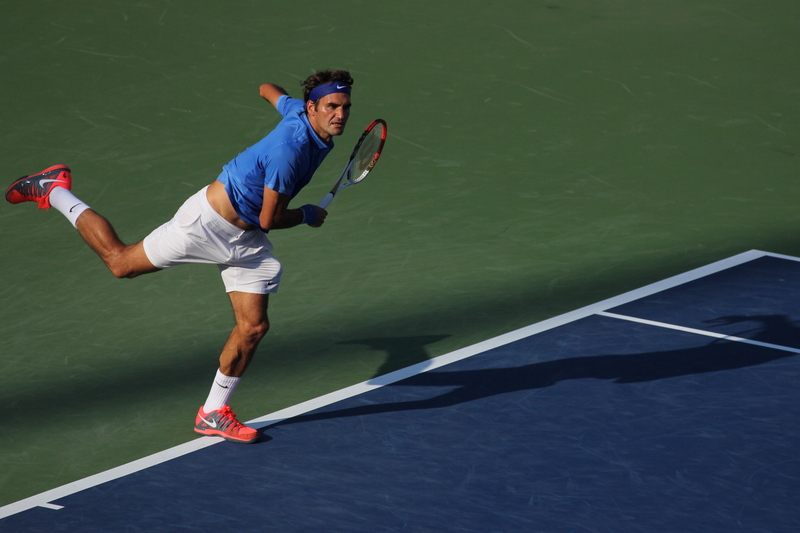 Certainly by the end of last season, Federer’s back problems seemed to be behind him. His results improved—concluding with a semi finish at the World Tour Finals—and he talked confidently of his condition, his plans to play a full 2014 schedule and, he hoped, win a few tournaments. But despite putting his money where his mouth is—his calendar contains a complete list of Grand Slams and Masters tournaments, though he is “unlikely to play Davis Cup”—Federer remains pragmatic about the season ahead. I have to wait and see the start. My gut feeling is that it will be March or April before I’m in top form again… Last season was difficult because back pain time and again imposed restraints on my training. Now I am able to try things that I was afraid to do last spring and summer. I think he’s going to do maybe 10 weeks, so I don’t see him so much in a coaching role, more as an inspiration—a legend joining my team, spending time, you know talking, discussing…We both still don’t know exactly what it’s going to be like. He’s going to come to Melbourne in a couple of weeks—no big expectation as such, but we’re going to have a good time together. And, given the energy that went into his 2014 pre-season, it looks as though Federer is still ‘up for it’, confirmed by a strong run through a difficult Australian draw: Jo-Wilfried Tsonga beaten in straight sets int he fourth round and Andy Murray in four sets in the quarters. He still intends to keep the rest on their toes, intends to defy the years and the predictions, intends to experiment, and all the while doing the off-court stuff for fans and ball-kids, the fund-raising exhos—the day before the Australian Open—and playing the media game, even if it involves koalas and kangaroos.